Fuchsia Dunlop describes Sichuan food, Chuan Cai as the spice girl of Chinese cuisine “bold and lipsticked with a witty tongue and a thousand lively moods.” Too true. Even the Chinese warn you against the chilli heat of Sichuan cooking “Ni pa bu pa la?” “Are you afraid of chilli heat?” but once you get it in the right balance it’s addictive and milder alternatives seem bland. Since I returned from China I’ve been hoping to re-create those taste sensations at home. Drumroll everybody… this is my first time ever to create a dish without a recipe. It’s based on the Seafood Typhoon Style prepared for me Inside the Kitchen of the China Sichuan. One of the things I’m determined to do as I learn to cook Chinese food is to use the best of Irish ingredients along with authentic Chinese spices and flavourings. I’m convinced there’s a marriage made in heaven to be had here. After a morning spent yesterday at Cavistons of Glasthule, thanks to @mumofinvention, learning how to prepare crab and lobster with Peter Caviston, seafood was on my mind as I made my way south to Wexford. Seafood is not readily available in the land-locked province of Sichuan which explains the popularity of Fish-fragrant flavours there – see recipe for Fish Flavoured Pork Shreds. But fish is abundant here in Wexford in the south east of Ireland where I was born and where I spend many weekends in the little fishing village of Duncannon. 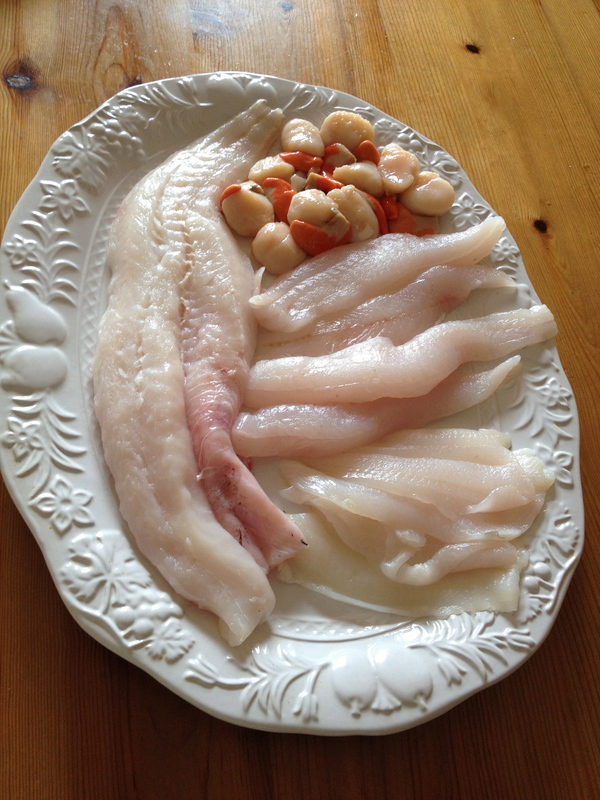 I recently tracked down, through Twitter, a relatively new fish shop in nearby Arthurstown called Fish Ahoy. They are on Facebook and on Twitter @Fishahoy1. That means that it’s now possible to get fresh fish from Bernie by arrangement on a Sunday morning if a new boat load comes into Dunmore East or Duncannon late on the Saturday night. So I made this dish with the zingy fresh fish that had come in with the last catch of the day yesterday rather than the combination of sole. 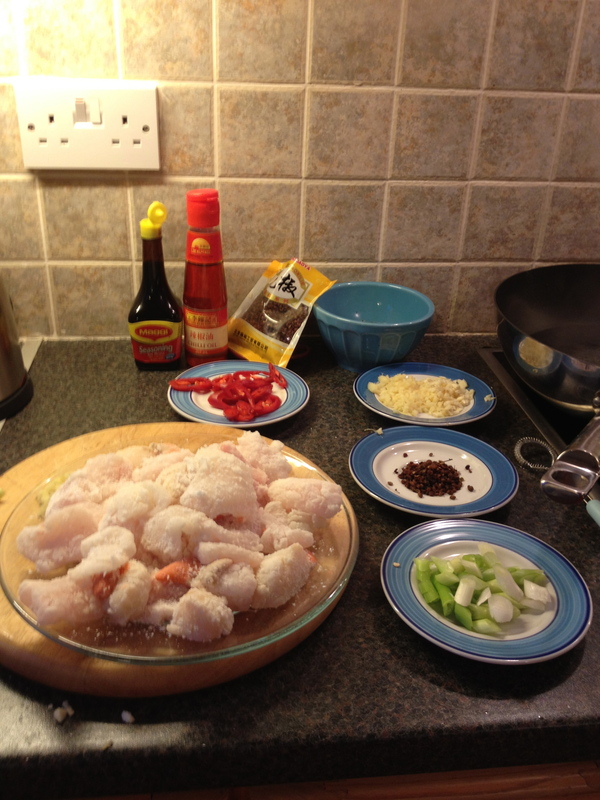 monkfish, prawns and scallop used in China Sichuan. Now don’t be expecting very precise amounts of ingredients – I’m new at this lark after all – just play around to suit your personal taste. A cleaver (ok you don’t have to have a cleaver but I really like mine). 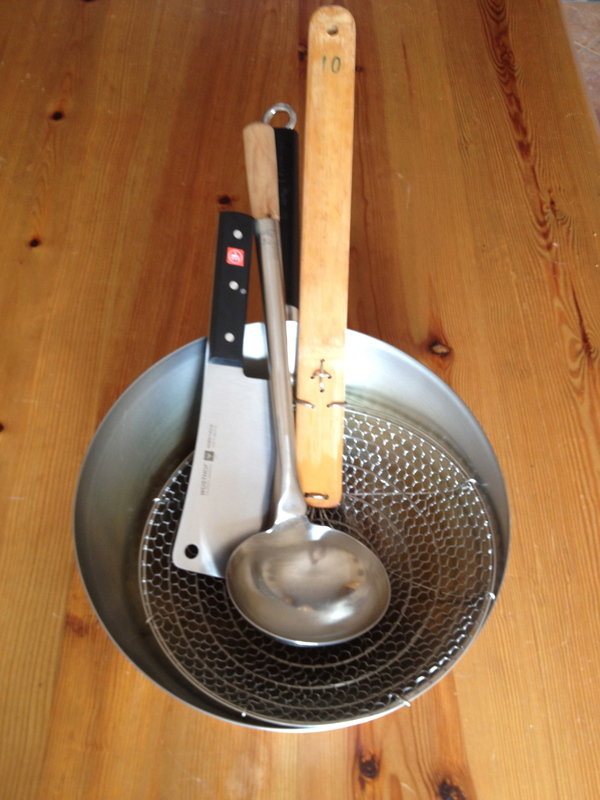 All of these utensils should be available in your local Asian supermarket and are not very expensive. Cut the fish into pieces of similar size to the scallops, score lightly in a cross hatch pattern, mix with your hand in the lightly beaten egg white and a little seasoned potato flour. Shake off any excess flour. Mince garlic and ginger – roughly a heaped tablespoon of ginger and two cloves garlic. Slice the red chilli and 3 spring onions at steep angles so that they look like horse ears. I used whole Sichuan pepper corns this time – about a heaped teaspoon but you could dry-fry and ground them first for a slightly milder taste. Next time I will use more. Soak the black beans in some warm water for a few minutes then squeeze the water out of them. Line up all your ingredients in small bowls or on saucers in the order in which you use them in the dish. This really helps as it all happens very fast at the end. Wash the Pak Choi and put a large pan or wok of lightly salted boiling water on to simmer. Heat enough oil in a wok until smoking to deep fry the fish. Plunge the Pak Choi into the boiling water for about a minute or two, drain and leave to one side nicely arranged on the serving platter. Deep fry the fish for about a minute and a half in the hot oil. Drain off (I used the wire mesh Chinese strainer for this) and rest on kitchen paper. Discard all bar about a tablespoon of oil from the wok or wipe out the sunflower oil and heat a little groundnut oil. Add the minced garlic and ginger to the wok, and stir fry for a few moments using the back of the ladle. Add in the chilli, spring onion, sichuan pepper, stir fry over high heat for a few moments and then add in the drained black beans. Add back the fish to warm through, moving everything very fast around the wok using the back of your ladle. Add a dash of chilli oil and Maggi sauce to season to taste. 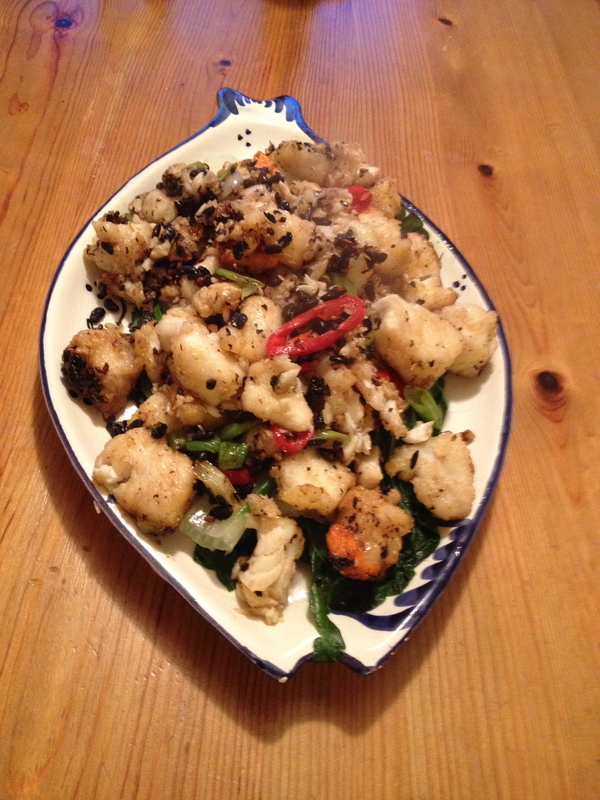 Serve on a platter on a bed of Pak Choi with simple boiled rice. 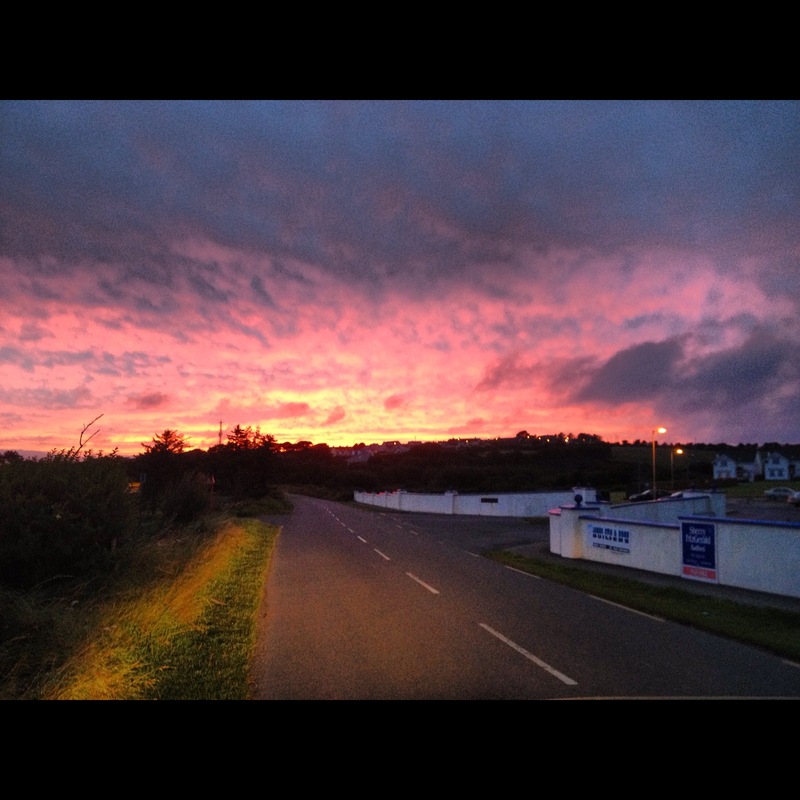 Verdict: – the magic flavours of Sichuan on our table in the sunny south east of Ireland. Heaven on a plate. I’m so excited to reading your Chinese cooking posts. I LOVE good Chinese food, and it’s not often in good supply in the States. Great post! Believe me, Ireland has been on my places to visit for a LONG time. Crossing my fingers my husband and I can go next summer. Thanks so much for checking out my blog, too!